What’s on your Bucket List? Are you ticking off your goals? Reflecting on our life, one rainy weekend Trevor and I put together a Bucket List with a few key things we wanted to achieve in our lifetime. Each year we’ve managed to tick a few of those boxes! We discovered we had similar interests in our lists, not all were the same but many do-able together so it’s been our challenge to share our goals. Life is always a game of give and take so we’ve blended our lists where possible and tried to share our highlights. Some of our Bucket List items have been achieved but I often feel that life gets in the way and sometimes and we deviate off the path. Seeing Penguins ‘in the wild’ was one of my wish list items. 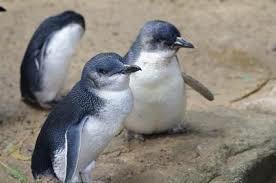 We visited Phillip Island in Victoria where there is a Penguin Sanctuary which was every bit as amazing as I’d hoped. The Ultimate Penguin Tour took us to a secluded beach where the penguins come ashore at dusk only a few feet from where we sat huddled against the sand dunes. A most surreal experience! Tick! The Australian War Memorial is Australia’s national memorial to the members of its armed forces and was high on Trevor’s Bucket List. A national military museum and tribute to those who’ve served Australia, it is widely regarded as one of the most significant memorials of its type in the world. 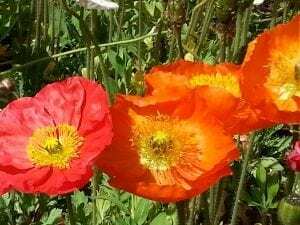 Our bonus was a trip to the National Art Gallery and Canberra’s Floriade which opens every spring with a mass of beautiful flowers in display. 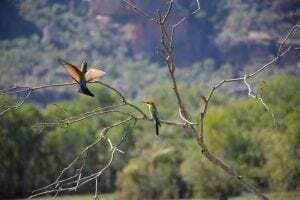 Kakadu has always been on my ‘to do’ list and as Trevor had already been, he was keen to show me around. It was an extraordinary immersion in culture and country and I recommend a visit to these lands for anyone who thinks they are aligned to the environment. I particularly loved Ubirr Rock and the miles and miles of nothingness – horizon to horizon. 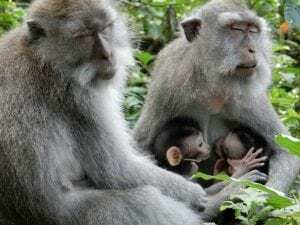 Visiting the Sacred Monkey Forest at Ubud has been on my Bucket List for many years. We were lucky enough to visit Ubud last year and were fascinated by the thousands of cheeky monkey’s roaming around the Monkey Forest. A very extraordinary experience. Finally ticked that one off! Tassie is the most southern-most state of Australia and for me has been a ‘I’ll get there one day’ thought. 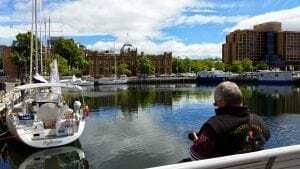 Crisp cool days, beautiful water-front areas, steeped in Aussie history it was a pleasure to visit and although we ticked that box, we promptly put Tasmania back on the list. We have to see more! San Francisco was one of the places we both listed on our Bucket Lists. The Golden Gate Bridge, Napa Valley and Alcatraz were also on our lists. Tick! Tick! Tick! 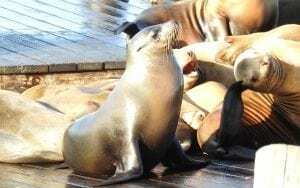 What a buzz that city was, we had so much fun and there were so many bonuses for us that we hadn’t considered like Haight Ashbury District, the Sea Lions on Pier 39 and running into all the Santas for the annual Santa-Con charity event every year. An amazing fun place to visit! The colours of the Grand Canyon have to be seen to be believed! 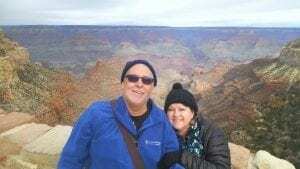 A helicopter tour over the south rim of the Grand Canyon was one of our highlights. The helicopter option was on my list, not Trevor’s however he came too .. and loved it! The bonus was seeing elks in the wild. Tick that box! 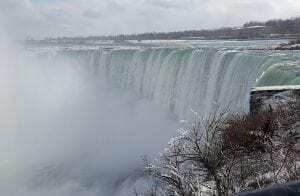 Niagara Falls was one of our favourite places to visit – in winter! Cold weather, crystal clear blue green water, mist rising from the Falls and turning into snowflakes. Snowflakes melting as they touched our skin. Hot Irish coffees to warm up and beautiful night skies. Niagara Falls should be on everyone’s Bucket List. An amazing big tick off our our List! A Caribbean cruise has always been on our Bucket List. We booked to leave Florida with Celebrity Cruises. It was a great opportunity to see a few islands on our Bucket List and experience some rest and relaxation onboard a fabulous ocean liner. 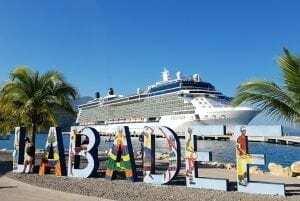 Haiti, Jamaica, Grand Cayman and Cozumel in Mexico – just whetted our appetite to see more of the Caribbean. Another tick … and we’ll come back to see more! 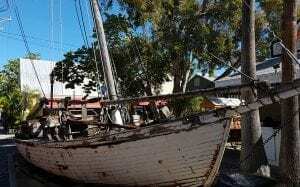 Key West was on Trevor’s list and until I researched it, it didn’t hold much interest for me. Once we arrived it was a totally different story! I’m currently re-reading Hemingway as it made such an impression. Key West was the one place in America I felt most ‘at home’ in. Friendly people, warm tropical weather, great food options and a colourful history of a somewhat shady nature. I totally loved it! 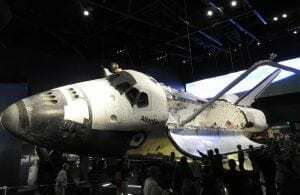 Kennedy Space Centre was always on Trevor’s Bucket List, so a visit to NASA at Cape Canaveral was a given. I was mildly curious so we planned to spend a day there. By our 3rd day we both decided it had been one of the ‘biggest’ highlights of our trip. Saturn V, Apollo and the Atlantis Space Shuttle was easily one of the most impressive displays we’ve ever seen. And yes, we will go back! New Orleans has a reputation to be the home of music and it certainly had a vibe to it. There were people in the streets day and night, musicians, street performers and each day was a hive of activity. Nawlins was everything that the guide books promised, and more! 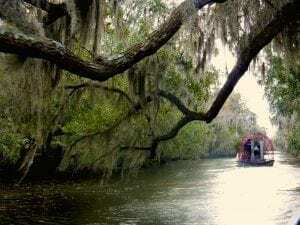 History, culture, creole food and people having a great time. We sure ticked that box! We’re not sure what’s next yet, but for sure it will be ticking some more of our goals? Perhaps some more adventures around Australia? Have you got any suggestions? We’d love to hear about your Bucket List.